In recent decades, auto manufacturers have made enormous progress in designing safety features to keep vehicle passengers safe, and researchers know more every day about why drivers get into accidents. Unfortunately, these facts have not prevented a precipitous rise in fatal car crashes across the US. Fatalities have risen among every type of roadway occupant, but according to recent research, the group with the highest spike in fatality rate is that of pedestrians. Read more about why we are at the highest pedestrian fatality rate today, and speak with an Idaho personal injury lawyer with additional questions. The Insurance Institute for Highway Safety has recently released a report showing a stark rise in pedestrian deaths on US roads. Their research shows that the rate of fatalities among pedestrians has gone up 46% between 2009, when an all-time low number of 4,109 pedestrians were killed on the road, and 2016, when 5,987 pedestrians died in traffic accidents. 2016’s total fatality rate among pedestrians is the highest since 1990, when 6,482 pedestrians died in traffic accidents. Experts are still looking for the reasons behind the sharp increase in fatalities among pedestrians. Some point to the increase in vehicle miles traveled overall in recent years. Others suggest that an increased interest in health and exercise has led to a greater number of people commuting on foot rather than by car. 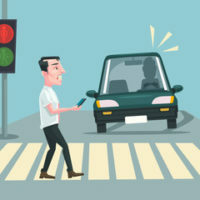 Many suspect, however, that the rise in distracted driving has resulted in more drivers failing to complete a full scan of the roadway before making turns or traveling through intersections where pedestrians may be in crosswalks. Losing a loved one in a motor vehicle accident can be devastating. Even if an accident isn’t fatal, victims can suffer major injuries in pedestrian accidents such as broken ribs, leg fractures, traumatic brain injuries (TBI), or spinal fractures. These injuries can require great time and expense to treat. Victims of pedestrian accidents may have a right to compensation from the driver who caused their injuries through an insurance claim or lawsuit. A knowledgeable personal injury lawyer can help you determine your legal options after a major pedestrian accident. For help exploring your options for compensation after a serious Idaho pedestrian accident, contact the experienced, compassionate, and effective Boise personal injury lawyers at Pedersen & Whitehead for a consultation at 208-336-2552, with additional offices in Twin Falls at 208-734-2552.